Twiggy and Opal: Placemats :: Lots and Lots of Placemats! Back in January I was asked if I could make custom placemats. Not just any placemats, placemats from a drawing they had made from tile they had seen. Tile can be a big inspiration for quilt ideas and upon seeing the drawing I thought it was something I could figure out. My version may not be exactly like the drawing, but she was totally fine with that. Mostly it was about the shapes, colors and size. It took a while for me to figure out the best way to go about it. How do I make each one the same? How can I make sure each point, each intersection will line up? Can I do it on EQ7? I pondered. I played. I drew shapes and cut them out like a puzzle. My first thought was to work with a top and bottom section. (horizontal) It didn't work exactly the way I wanted it to. Eventually I figured out that if I made two rows of triangles it just might work. There was still the issue of making each placemat, each section, each piece and each color line up...but I came up with the solution! Paper pieced! Only because I needed certain sections to line up and only because each placemat had to be the same. Yes, it was a lot of work! It looks relatively simple, and in all honestly it was once the math and templates were figured out. I made a test placemat, sent off fabric swatches and waited for the thumbs up. I should mention that I needed to make sixteen (16)...yes, you read that right! 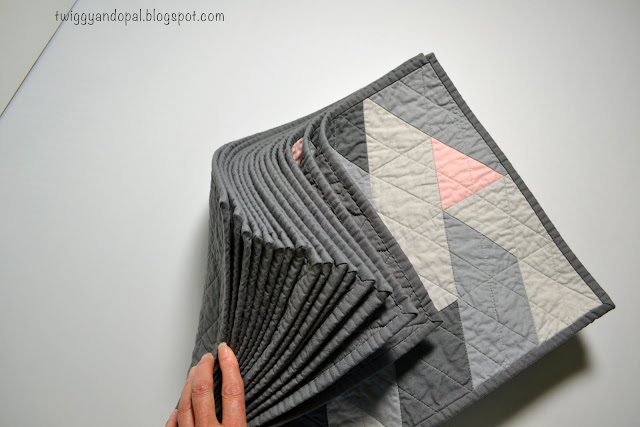 Sixteen placemats! Which is why I needed approval on the colors and test out my pattern. You might wonder why anyone would need that many placemats?! She said she her children tend to make a mess while eating...and this way she could just switch them out every time. Here's a close up of one finished placemat. You see how the top pink needed to line up? And the light gray on the top right that needed to line up with the light gray on the bottom? That was the reason I thought paper piecing each triangle was my best option. ...then stitched the top and bottom together...yes...sixteen times! Here's the proof! They all matched! 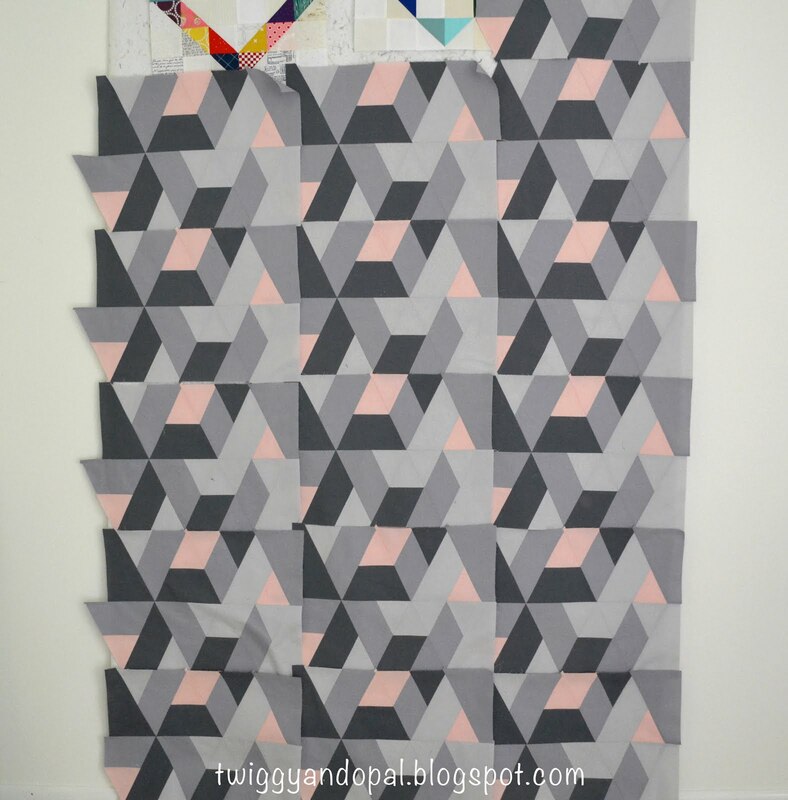 I'm sure you won't surprised when I tell you that after seeing all these on the design wall, I started getting ideas for a quilt or three!! Another time perhaps! You might think the hardest part was done, and in some ways it was. 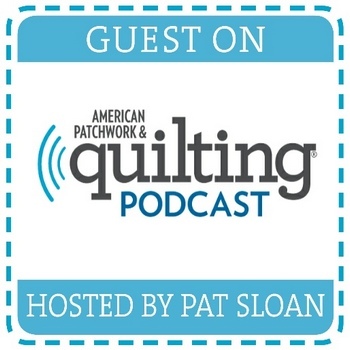 But imagine this: trimming 16 placemats, cutting 16 pieces of batting and backing, making 16 sets of binding, and then quilting 16 placemats, sewing the bindings on and eventually hand stitching each and every binding to the back! I cannot lie, this process from start to finish became very repetitive and mind numbing by the end! I know I shouldn't complain and I'm not...it was a lot. A lot! Usually I make my placemats larger than the 12" x 15" requested. These days you have to be flexible with the 'norm'. You have to consider table size and shape to living space available. Wow ! You did a wonderful job Jayne ! And on the top of that they form a really interesting design all together. I have to admit they took a lot of time and will power, but they really did turn out exactly as I wanted them to! Great placemats! 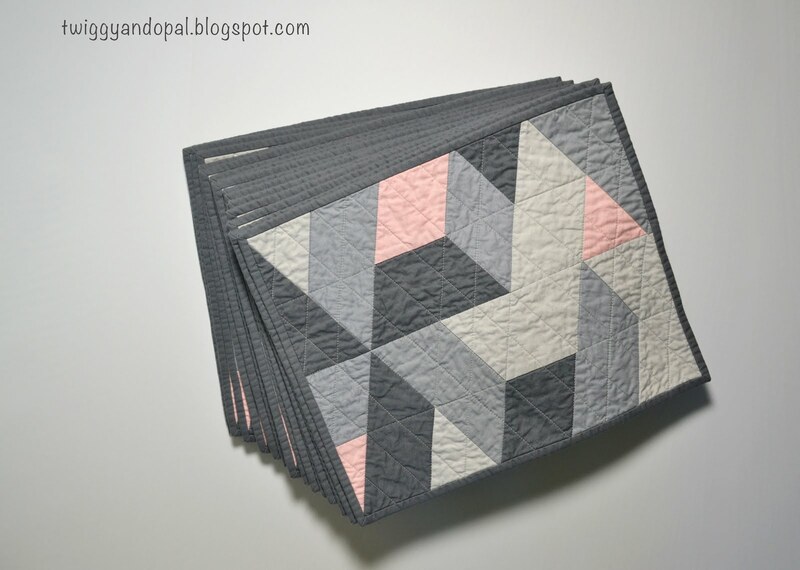 I really like your design and agree with you....all the placemats together would make a wonderful quilt. Congrats! on your finish. That's really 16 nini quilts and yes, a lot ot work, but they are lovey! That' going to be one nice dinner table with these on it! It was a big undertaking! When the idea finally took shape and every thing came together…I was pretty thrilled! You know me too well don’t you?! 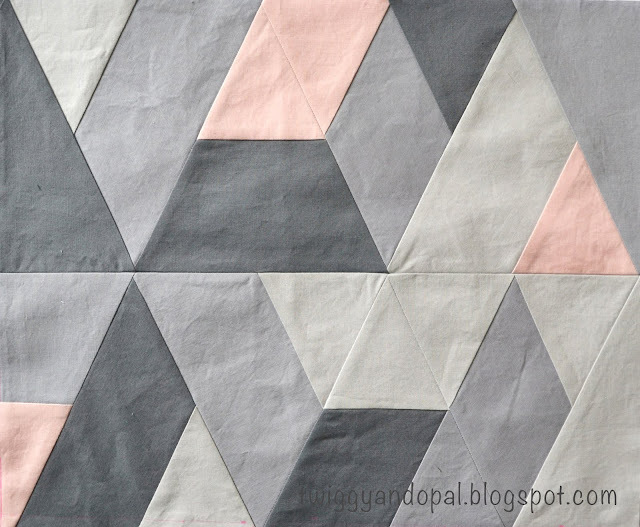 If I can use a scrap from a previous project…I will! Until every piece is gone! Stay tuned! So cute and I agree that a quilt would be wonderful in this pattern! Also, you're right about the time and material it takes for binding placemats...so much work for a small piece. 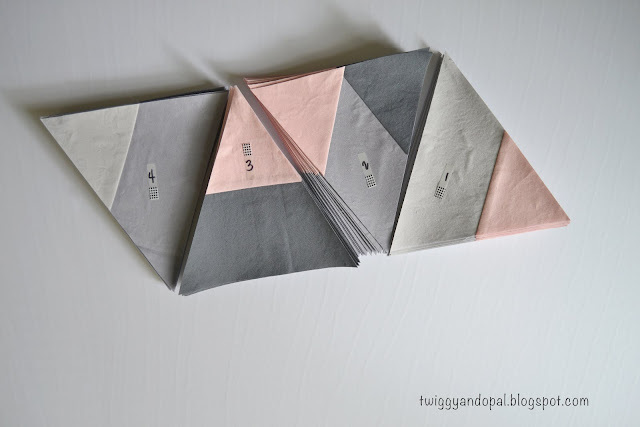 Placemats are a surprising amount of work, doubly so for all the paper piecing! I like to machine sew on the binding for placemats now that I am more confident in that skill. They really do take a lot of work! The paper piecing wasn’t that bad. I think because the pieces were big and it made taking the paper off pretty easy. I have yet to try machine stitching on bindings! I know…I’m way behind. It’s just that I love hand stitching bindings on! Just wow. They are gorgeous! Is there any chance you could post the pattern for these? Thank you for asking! I’m debating what I want to do with this design! I have a few ideas which include a free pattern but have yet to decide! If I do, I will certainly write a post on my blog and have the pattern available on Craftsy! Oh my goodness! 16!! I admire you for sticking with it and getting them done. I would not have had the patience for anything that mind numbingly repetitive. They are lovely, Jayne. wow congrats. you did a fabulous job. you are very sweet doing this for someone else. i love how they turned out with the colors used. I know 16 placemats can be mind numbing, but you did such a fabulous job with them. They look really great! Awesome job.............love the placemats !! Wow...16! I can see how that could become a bit mind-numbing after about the 8th or 9th one. :) But, they look lovely and you did a wonderful job. I hope your client loves them! Beautiful! I love them all together on the wall too! What a fun quilt it would make! Wow....what an impressive, seriously impressive undertaking.......I love them! 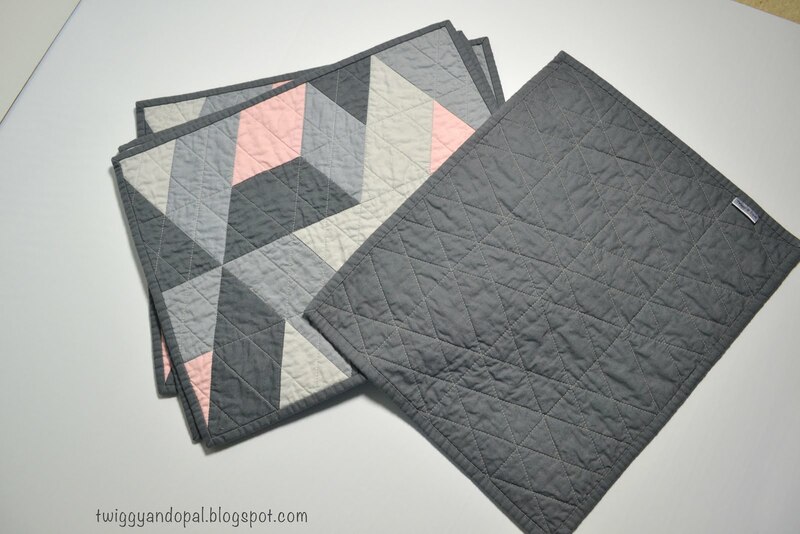 I love quilted triangles!!! What a load of placemats! You done good! I hope you made a TON of money for all that beautiful work. What a creative challenge! Thank you for sharing your process and for linking to TGIFF. Great job!!! The only time I've made placemats, I actually basted them all together on one piece of backing and batting. Then you only have to trim once... still not an easy task!!!! I love these placemats!!!! Beautifully done!!!! These placemats are awesome! I also would be interested in a pattern for them, but perhaps a little larger sized. And I think you should charge for the pattern. You deserve to be compensated for your time, perserverence, and brilliance! Take care, Mary. Love your placemats! I admire your persistence! You did a fantastic job, the placemats look great!! Hi Jayne, love your placemats. Making 16 would also drive me nuts but they do look great!